The demonstrations had come in the wider context of laws designed to restrict the movement and employment of those penned up in the equivalent of an open air prison. Sources disagree as to the behaviour of the crowd. Some state that the crowd was peaceful, while others state that the crowd had been hurling stones, and that the shooting started when the crowd started advancing toward the fence. 69 protesters were killed, and 289 casualties in all. A storm of international protest followed. The South African foreign ministry explained that its decision had been taken to protest the indiscriminate killing of protesters. 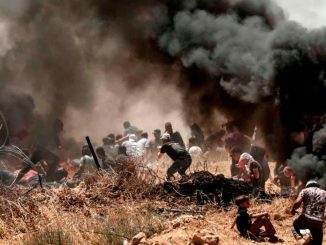 “Because of the grave and indiscriminate nature of the latest Israeli attack, the South African government has decided to recall Ambassador Sisa Ngombane with immediate effect,” read part of the statement. The Gaza protests had coincided with the opening of the US Embassy in Jerusalem. Palestinians have long seen East Jerusalem as being their potential capital within the vaunted “two state solution” of a Palestinian state comprised of what is currently the occupied West Bank and Gaza Strip. In deference to this goal, most countries have treated the status of Jerusalem (which is a city held sacred by Christians, Jews and Moslems alike) as something due to be ultimately determined only within the context of a final peace deal. In December 2017, Togo was the only African country to support the US motion to establish an American embassy in Jerusalem. The United States which was furious at the lack of support from its allies, threatened to cut aid to countries that don’t support its positions at the United Nations and in several other international fora. Israel’s foreign ministry said thirty three countries attended the ceremony including Angola, Cameroon, Republic of Congo, Democratic Republic of Congo, Ivory Coast, Ethiopia, Kenya, Nigeria, Rwanda, South Sudan, Tanzania and Zambia. In Washington, a White House spokesman faulted Hamas for the violence. “The responsibility for these tragic deaths rest squarely with Hamas,” said the official, Raj Shah, at a regular press briefing. “Hamas is intentionally and cynically provoking this response. And as the secretary of state said, Israel has the right to defend itself.” He said he had no answer on whether the White House would be in touch with the Palestinians but said a peace plan would be brought forward “at the appropriate time.” Mr. Shah added that Monday’s events would not have an impact on it. Yeah, right. They made us do it. This stance by the Trump White House seems to be entirely consistent with the formal resolution that was passed back in 1960 (in the wake of the Sharpeville massacre) by the Mississippi state legislature, which chose to congratulate the government of South Africa for its “staunch adherence to traditions, in the face of overwhelming external agitation”. Footnote: One bizarre aspect of the Israeli/Palestinian conflict has to do with the understandable sensitivities around Israel’s right to exist as a nation state – even though this is commonly expressed by Israelis (and Americans) who routinely deny that Palestinians actually exist, as a people. This week, this denial of the existence of competing rights was echoed by Israeli PM Benjamin Netanyahu’s description of Jerusalem as the “eternal, undivided capital of Israel”. Roman restoration of control over Palestine, circa 630-636 was brief… The Muslim commander of the faithful and vicar of the prophet, Omar bin al-Khattab, took Jerusalem in 636-37 and visited it that April. Muslim rule was to last save for the short hiatus of the Crusader kingdoms until World War I, when General Allenby took Jerusalem from the Ottoman Empire. Muslims viewed Jews as a legitimate religious community, unlike Inquisition-era Europeans such as the Spanish, and so Jews were free to live in Jerusalem, though few did since it was a small and insignificant city and many went to Muslim capitals such as Cairo, and later Istanbul, instead. So it isn’t true that Jerusalem has throughout history been “Jewish”. For hundreds of years under the Romans, whether pagan or Christian, the city was made completely devoid of Jews, at least by law. Ironically, it was Iran and the Muslims who rescued the Jews from that exile from Jerusalem. As mentioned, if Netanyahu was referring to Jerusalem in a romantic sense… ie, as an identity-defining capital and focal point of Jewish aspirations, he has a point. The trouble is, Palestinians feel exactly the same eternal identification with their homeland, Palestine – and with its capital in east Jerusalem. That’s why a just peace cannot emerge if one side continues to treat the process as being purely a zero sum game. This has been a week for sad songs. Yet happily after what seems like decades of rancour and indifference, the two members of Outkast – Andre 3000 and Big Boi -recently got together amicably at the graduation ceremony of Big Boi’s son. Almost as miraculously, Andre 3000 released this fine tribute song to the memory of his parents. (His mother died in 2013, his father a year later.) The pianist on this track is Andre’s long time collaborator, Kevin Kendrick. Can one dare to hope for an Outkast reunion?